The Supplemental Nutrition Assistance Program (SNAP) has been active for more than 50 years, providing aid to families throughout the country. 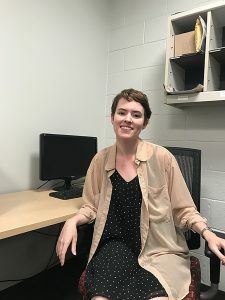 Colette Hanlon’s Summer Scholars project focuses on the lived experiences of those who grocery shop using SNAP benefits, or food stamps. Hanlon, a rising senior sociology major and economics minor from Oxnard, California, is working with her mentor, Keith Brown, Ph.D., associate professor of sociology, to examine the social meaning of SNAP, mainly, how low-income consumers make decisions regarding healthy eating and food costs and if there are any common themes in purchasing. She will conduct two differently styled interviews with about 50 participants: “shop along” and sit-down interviews. Hanlon is working as the project’s coordinator. She has advertised the project to community organizations, such as Philabundance and Coalition Against Hunger, received participant calls, and scheduled, transcribed and conducted interviews for about 50 participants, who each will be interviewed twice. The project also includes Miriam Kahn, a retired anthropology professor at the University of Washington, and Mary Segal, who researched health policy while at Temple University. Kahn and Segal will focus on the program’s health and nutrition aspects. Brown, whose teaching interests include ethical consumption, culture and economic sociology, says that Hanlon’s project is different than others because most current marketing and consumer behavior research focuses on wealthier consumers. The team will use the data they collect to create memos, which will be sent to community health organizations and grocery stores that seek to better provide access to healthy food for low-income consumers. The team is also planning to publish their research in at least two academic journals, and possibly, a book. Hanlon will continue her research on this project for her honor’s thesis. As a result of her Summer Scholars experience, she is considering a career in research in either economic sociology or behavioral economics.